Dr. George M. Spyrou holds a BSc on Physics, an MSc on Medical Physics and an MSc on Bioinformatics as well. During his PhD he worked on algorithms and simulations focusing on breast cancer imaging. Early in 1990s Dr. Spyrou started thinking and working on the ways he could apply his knowledge in mathematics and physics on medicine and biology. In 1994 he joined the Medical Imaging Research Group of Prof. George Tzanakos at the Physics Department of University of Athens as Research Associate, working in the project of the small animal PET prototype design and construction. In 1998 he was selected by the Academician Prof. Panos Ligomenides to work at his Lab on a medical image analysis and decision support project concerning the early diagnosis of breast cancer. At the very beginning of the Biomedical Research Foundation of the Academy of Athens (BRFAA), the Foundation asked for an informatics-oriented scientist to be responsible for the design and development of the whole informatics infrastructure at BRFAA. Dr. Spyrou was then selected to take this responsibility being appointed as a Research Scientist of level B. Since 2001 and for over 10 years he worked on the strategic plan and implementation of IT development at BRFAA, acting as the Head of the Department of Informatics and New Technologies of BRFAA. Among his tasks was to design, organize and supervise from scratch the whole Information Technology infrastructure of the Institute. Namely, he had been involved in the design and supervision of network infrastructure, computational infrastructure, multimedia infrastructure, data services, web hosting services, administration databases, video/web conference services, e-learning, high performance computing infrastructure. In parallel, he was organizing his research group and was running his own research on bioinformatics and medical informatics. In 2007 Dr. Spyrou was promoted to Senior Research Scientist (Level A) at BRFAA after successful evaluation. Since 2009 he is teaching a full semester course in the Postgraduate Program “Information Technologies in Medicine and Biology” at the University of Athens. He is also a visiting instructor on Systems Bioinformatics and Network Analysis in other two postgraduate courses, namely the Master program on “Complex Systems and Networks” at the Aristotle University of Thessaloniki and the Master program on “Translational Research in Molecular Biology and Genetics” at the Democritus University of Thrace. Further to them, Dr. Spyrou has been instructor at the Greek National Centre for Public Administration and Local Government (EKDDA) for the period 2005-2014, with over 300 lecture hours. Through his teaching activities Dr. Spyrou has the opportunity of supervising/mentoring a number of MSc and PhD students. His work includes computational methods that act as bridges between molecular biology, systems biology and molecular medicine, exploiting computational intelligence and high performance computing for multi-omics network analysis, systems bioinformatics and in silico drug discovery. Up to now, he has served as Reviewer, Invited Speaker, Chairman and Scientific Advisory Board Member in topics related to Biomedical Informatics topics while he has authored over 160 scientific publications in peer reviewed journals and international conference proceedings. 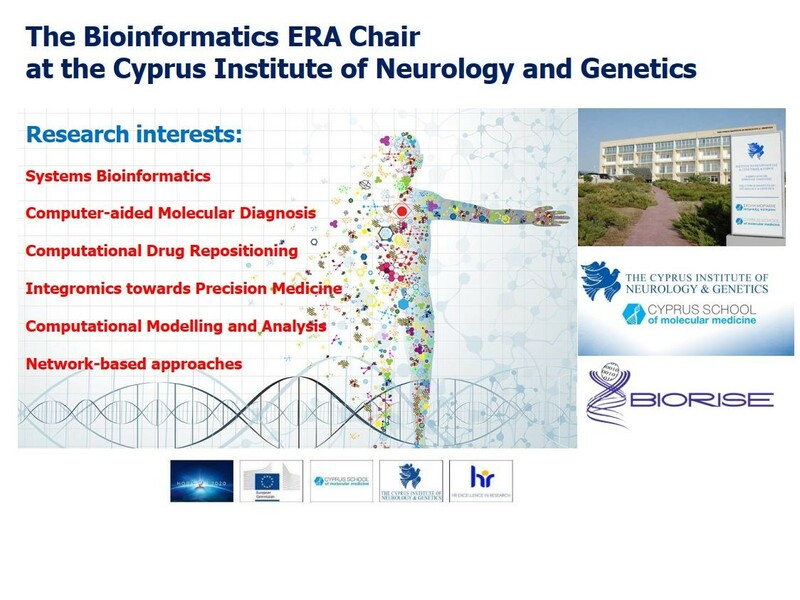 Dr. Spyrou is the Bioinformatics ERA Chair Holder and the Head of the Bioinformatics Group at the Cyprus Institute of Neurology and Genetics. - Representative of Cyprus in the Management Committee (MC Delegate) of the COST Action CA15120 entitled: “Open Multiscale Systems Medicine (OpenMultiMed)”. 2017- Postgraduate Course Coordinator for the Bioinformatics Course (Full semester) at the Cyprus School of Molecular Medicine. 2017 Associate Faculty Position at the Cyprus School of Molecular Medicine. 2009-2015 Full Semester Course Teaching (“Simulation Methods in Medicine and Biology”) at the Postgraduate Program "Information Technologies in Medicine and Biology", organized by the Department of Informatics and Telecommunications of the National and Kapodistrian University of Athens. 2015- Visiting instructor on Systems Bioinformatics and Network Analysis in postgraduate Master’s program on “Complex Systems and Networks” at the Aristotle University of Thessaloniki, Greece. 2015- Visiting instructor on Systems Bioinformatics and Network Analysis in postgraduate the Master’s program on “Translational Research in Molecular Biology and Genetics” at the Democritus University of Thrace, Greece. 2009-2016 Member of the Steering Committee of the Postgraduate Program "Information Technologies in Medicine and Biology", organized by the Department of Informatics and Telecommunications of the National and Kapodistrian University of Athens. 2007-2010 Instructor at the Summer School “Methods in Micro – Nanotechnology and Nanobiotechnology” organized by the National Center for Scientific Research Demokritos. Topics: “Applied Bioinformatics in BioNanoTechnology” (2007, 2008) and “Structural Bioinformatics: Molecular Simulations and Visualization” (2009, 2010). 2005-2014 Instructor at the Greek National Centre for Public Administration and Local Government (EKDDA) with over 300 lecture hours on information technology topics. 2008-2016 Supervised 3 completed PhDs from: School of Medicine, University of Patras and School of Electrical and Computer Engineering, National Technical University of Athens (1), Department of Informatics and Telecommunications, National and Kapodistrian University of Athens (2). 2002-2014 Co-supervised 4 completed PhDs from: School of Medicine, University of Patras (2), Health Informatics Laboratory, Faculty of Nursing, National and Kapodistrian University of Athens (1), School of Electrical and Computer Engineering, National Technical University of Athens (1). 2007- Supervised 17 Master Students from: School of Medicine, University of Patras and School of Electrical and Computer Engineering, National Technical University of Athens (1), Department of Informatics and Telecommunications, University of Athens (14), The Cyprus School of Molecular Medicine (2). 1. Emmanouil K. Ikonomakis, George M Spyrou, Michael N Vrahatis. Content driven clustering algorithm combining density and distance functions. Pattern Recognition, Volume 87, March 2019, Pages 190-202. 2. Andrea C. Kakouri, Christiana C. Christodoulou, Margarita Zachariou, Anastasis Oulas, George Minadakis, Christiana A. Demetriou, Christina Votsi, Eleni-Zamba Papanicolaou, Kyproula Christodoulou, George M. Spyrou. Revealing Clusters of Connected Pathways through Multisource Data Integration in Huntington’s disease and Spastic Ataxia. IEEE Journal of Biomedical and Health Informatics 2018 Aug 30. 3. G. Minadakis, M. Zachariou, A. Oulas, and G. M. Spyrou, "PathwayConnector: finding complementary pathways to enhance functional analysis," Bioinformatics, Aug 14 2018. 5. Brili S, Oikonomou E, Antonopoulos AS, Pianou N, Georgakopoulos A, Koutagiar I, Kafouris P, Stroumpouli E, Dounis C, Metaxas M, Spyrou G, Anagnostopoulos CD, Tousoulis D. 18F-Fluorodeoxyglucose Positron Emission Tomography/Computed Tomographic Imaging Detects Aortic Wall Inflammation in Patients With Repaired Coarctation of Aorta. Circ Cardiovasc Imaging. 2018 Jan;11(1):e007002. doi: 10.1161/CIRCIMAGING.117.007002. 6. Nikolas Dovrolis, George Kolios, George Spyrou, Ioanna Maroulakou. Computational profiling of the gut-brain axis: Microflora dysbiosis insights to neurological disorders. Briefings in Bioinformatics 2017 Nov 27. doi: 10.1093/bib/bbx154. 7. Anastasis Oulas, George Minadakis, Margarita Zachariou, Kleitos Sokratous, Marilena M. Bourdakou, George M. Spyrou. Systems Bioinformatics: increasing precision of computational diagnostics and therapeutics through network-based approaches. Briefings in Bioinformatics 2017 Nov 27. doi: 10.1093/bib/bbx151. 8. Toutouzas K, Skoumas J, Koutagiar I, Benetos G, Pianou N, Georgakopoulos A, Galanakos S, Antonopoulos A, Drakopoulou M, Oikonomou EK, Kafouris P, Athanasiadis E, Metaxas M, Spyrou G, Pallantza Z, Galiatsatos N, Aggeli C, Antoniades C, Keramida G, Peters AM, Anagnostopoulos CD, Tousoulis D. Vascular inflammation and metabolic activity in hematopoietic organs and liver in familial combined hyperlipidemia and heterozygous familial hypercholesterolemia. J Clin Lipidol. 2017 Nov 2. pii: S1933-2874(17)30487-7. doi: 10.1016/j.jacl.2017.10.019. 9. Marilena M. Bourdakou and George M. Spyrou. Informed walks: whispering hints to gene hunters inside networks' jungle. BMC Syst Biol. 2017 Oct 11;11(1):97. 10. E. Karatzas, M. M. Bourdakou, G. Kolios & G. M. Spyrou. Drug repurposing in idiopathic pulmonary fibrosis filtered by a bioinformatics-derived composite score. Scientific Reports. 2017 Oct 3;7(1):12569. 12. Protonotarios NE, Spyrou GM, Kastis GA. Automatic cumulative sums contour detection of FBP-reconstructed multi-object nuclear medicine images. Comput Biol Med. 2017 Apr 14;85:43-52. 13. Dovrolis Nikolas, Kolios George, Spyrou George, Maroulakou Ioanna. Laying in silico pipelines for drug repositioning: a paradigm in ensemble analysis for neurodegenerative diseases. Drug Discov Today. 2017 Mar 29. pii: S1359-6446(17)30135-6. 14. Toutouzas K, Koutagiar I, Benetos G, Aggeli C, Georgakopoulos A, Athanasiadis E, Pianou N, Trachanellis S, Patelis N, Agrogiannis G, Kafouris P, Filis K, Bessias N, Klonaris C, Spyrou G, Tsiamis E, Siores E, Patsouris E, Cokkinos D, Tousoulis D, Anagnostopoulos CD. Inflamed human carotid plaques evaluated by PET/CT exhibit increased temperature: insights from an in vivo study. Eur Heart J Cardiovasc Imaging. 2016 Dec 23. pii: jew219. 16. Papadavid E, Braoudaki M, Bourdakou M, Lykoudi A, Nikolaou V, Tounta G, Ekonomidi A, Athanasiadis E, Spyrou G, Antoniou C, Kitsiou-Tzeli S, Rigopoulos D, Kolialexi A. Aberrant microRNA expression in tumor mycosis fungoides. Tumour Biol. 2016 Nov;37(11):14667-14675. 17. Kypreou KP, Stefanaki I, Antonopoulou K, Karagianni F, Ntritsos G, Zaras A, Nikolaou V, Kalfa I, Chasapi V, Polydorou D, Gogas H, Spyrou GM, Bertram L, Lill CM, Ioannidis JP, Antoniou C, Evangelou E, Stratigos AI. Prediction of Melanoma Risk in a Southern European Population Based on a Weighted Genetic Risk Score. J Invest Dermatol. 2016 Mar;136(3):690-5. 18. Athanasiadis E, Bourdakou M, Spyrou G. D-Map: Random walking on gene network inference maps towards differential avenue discovery. IEEE/ACM Trans Comput Biol Bioinform. 2016 Feb 26. 19. Bourdakou MM, Athanasiadis EI, Spyrou GM. Discovering gene re-ranking efficiency and conserved gene-gene relationships derived from gene co-expression network analysis on breast cancer data. Scientific Reports. 2016 Feb 19;6:20518. 20. Argiris Sakellariou and George Spyrou, “mAPKL: R/ Bioconductor package for detecting gene exemplars and revealing their characteristics”, BMC Bioinformatics 2015 Sep 15;16(1):291. 21. John C.Siavelis, Marilena M. Bourdakou, Emmanouil I. Athanasiadis, George M. Spyrou and Konstantina S. Nikita, “Bioinformatics methods in drug repurposing for Alzheimer’s disease”, Briefings in Bioinformatics, 2015 Jul 21. pii: bbv048. 25. Antonopoulou,K., Stefanaki, I., Lill, C.M., Chatzinasiou, F., Kypreou, K., Karagianni, F., Athanasiadis, E., Spyrou, G.M., Ioannidis, J., Bertram, L., Evangelou, E., Stratigos, A. (2014) Updated field synopsis and systematic meta-analyses of genetic association studies in cutaneous melanoma: The MelGene database. Journal of Investigative Dermatology, 2015 Apr;135(4):1074-9. 26. Emmanouil I. Athanasiadis, Kyriaki Antonopoulou, Foteini Chatzinasiou, Christina M. Lill, Marilena M. Bourdakou, Argiris Sakellariou, Katerina Kypreou, Irene Stefanaki, Evangelos Evangelou, John P.A. Ioannidis, Lars Bertram, Alexander J. Stratigos and George M. Spyrou. A web-based database of genetic association studies in cutaneous melanoma enhanced with network-driven data exploration tools.”, Database (Oxford) (2014) Vol. 2014: article ID bau101; doi:10.1093/database/bau101. 27. Lionta E, Spyrou G, Vassilatis D, Cournia Z. Structure-Based Virtual Screening for Drug Discovery: Principles, Applications and Recent Advances. Curr Top Med Chem. 2014 Sep 29. [Epub ahead of print] PubMed PMID: 25262799. 28. Andreadis II, Spyrou GM, Nikita KS. A CADx Scheme for Mammography Empowered with Topological Information fromClustered Microcalcifications' Atlases. IEEE J Biomed Health Inform. 2014 Jul 25. [Epub ahead of print] PubMed PMID: 25073178. 29. Niarchou A, Alexandridou A, Athanasiadis E, Spyrou G. C-PAmP: large scale analysis and database construction containing high scoring computationally predicted antimicrobial peptides for all the available plant species. PLoS One. 2013 Nov 11;8(11):e79728. 30. Sakellaris T, Koutalonis M, Spyrou G, Pascoal A. A Monte Carlo study of the influence of focal spot size, intensity distribution, breast thickness and magnification on spatial resolution of an a-Se digital mammography system using the generalized MTF. Phys Med. 2014 May;30(3):286-95. 31. Paraskevopoulou MD, Vlachos IS, Athanasiadis E, Spyrou G. BiDaS: a web-based Monte Carlo BioData Simulator based on sequence/feature characteristics. Nucleic Acids Res. 2013 Jul;41(Web Server issue):W582-6. 32. Sakellariou A, Sanoudou D, Spyrou G, “Combining multiple hypothesis testing and affinity propagation clustering drives to accurate, robust and sample size independent classification on gene expression data, BMC Bioinformatics, 2012 Oct 17;13:270. 34. Foteini Chatzinasiou, Christina M. Lill, Katerina Kypreou, Irene Stefanaki, Vasiliki Nicolaou, George Spyrou, Evangelos Evangelou, Johannes T. Roehr, Elizabeth Kodela, Andreas Katsambas, Hensin Tsao, John P.A. Ioannidis, Lars Bertram, Alexander J. Stratigos, “Comprehensive Field Synopsis and Systematic Meta-analyses of Genetic Association Studies in Cutaneous Melanoma”, J Natl Cancer Inst. 2011 Aug 17;103(16):1227-35. 35. Alexandridou A, Dovrolis N, Tsangaris GT, Nikita K, Spyrou G. “PepServe: a web server for peptide analysis, clustering and visualization”, Nucleic Acids Res. 2011 Jul;39(Web Server issue):W381-4. 36. Anagnostopoulos AK, Tsiliki G, Spyrou G, Tsangaris GT, “Bioinformatics approaches in the discovery and understanding of reproduction-related biomarkers”, Expert Rev Proteomics. 2011 Apr;8(2):187-95. 38. A. G. Xanthopoulou, D. Anagnostopoulos, K. Vougas, A. Anagnostopoulos, A. Alexandridou, G. Spyrou, A.Siafaka-Kapadai, G.Th. Tsangaris, "A two-dimensional proteomic profile of Tetrahymena thermophila’s whole cell lysate", In Vivo. 2010 Jul-Aug;24(4):443-56. 40. Koutalonis M, Delis H, Pascoal A, Spyrou G, Costaridou L and Panayiotakis G, “Can electronic zoom replace magnification in mammography? A comparative Monte Carlo study”, Br J Radiol. 2010 Jul;83(991):569-77. 41. A.Sakellariou, D.Sanoudou, G. Spyrou, “Investigating the minimum required number of genes for the classification of neuromuscular disease microarray data”, IEEE Trans Inf Technol Biomed. 2011 May;15(3):349-55. 42. G. Giannakopoulou, G. Spyrou, A. Antaraki, I. Andreadis, D. Koulocheri, F. Zagouri, A. Nonni, G. Filippakis, K. Nikita, P. Ligomenides and G. Zografos, “Downgrading BIRADS 3 to BIRADS 2 category using a computer-aided microcalcification analysis and risk assessment system for early breast cancer”, Comput Biol Med. 2010 Oct 13. 43. A. Gaitanis, G. Kontaxakis, G. Spyrou, G. Panayiotakis, G. Tzanakos, “Studying the properties of the updating coefficients in the OSEM algorithm for iterative image reconstruction in PET”, Comput Methods Programs Biomed. 2010 Sep;99(3):219-29. 46. A. Gaitanis, G. Kontaxakis, G. Spyrou, G. Panayiotakis, G. Tzanakos, “PET image reconstruction: A stopping rule for the MLEM algorithm based on properties of the updating coefficients”, Comput Med Imaging Graph. 2010 Mar;34(2):131-41. 48. Frigas A, Spyrou G, Antaraki A, Patiraki E, Koufopoulos K, Mantas J, Ligomenides P. “Design of a 'smart' patient record system for mammography patients”. Stud Health Technol Inform, 2009, 150:130-4. 53. Antonios Frigas, George Spyrou, Panos Ligomenides, Marianna Diomidous, John Mantas, “Investigating the Classification Robustness of a Computer Aided Diagnosis System Using Mammographic Images”, Acta Informatica Medica, 2009, Vol. 17, No2: 64-6. 56. Kolialexi A, Mavrou A, Spyrou G, Tsangaris GT., “Mass Spectrometry based proteomics in reproductive medicine”, Mass Spectrom Rev. 2008 Nov-Dec;27(6):624-34. 57. M Koutalonis, H Delis, G Spyrou, L Costaridou, G Tzanakos and G Panayiotakis, “Monte Carlo studies on the influence of focal spot size and intensity distribution on spatial resolution in magnification mammography”, Phys. Med. Biol., 2008 Mar 7;53(5):1369-84. 58. Sakellaris T, Spyrou G, Tzanakos G, Panayiotakis G., Energy, angular and spatial distributions of primary electrons inside photoconducting materials for digital mammography: Monte Carlo simulation studies. Phys Med Biol. 2007 Nov 7;52(21):6439-6460. 60. Thireou T., Spyrou G., and Atlamazoglou V, “A Survey of the Availability of Primary Bioinformatics Web Resources", Genomics, Proteomics & Bioinformatics, 2007, 5(1): 70-76. 62. Floros X, Spyrou G, Vougas K, Tsangaris G, Nikita K, “Study on Preprocessing and Classifying Mass Spectral Raw Data Concerning Human Normal and Disease Cases”, Lecture Notes in Computer Science, LNBI 4345, pp. 390–401, 2006. 64. A Frigas, S Kapsimalakou, G Spyrou, K Koufopoulos, S Vassilaros, A Chatzimichael, J Mantas, P Ligomenides, “Evaluation of a Breast Cancer Computer Aided Diagnosis System”, Stud Health Technol Inform. 2006;124:631-6. 65. Delis H, Spyrou G, Costaridou L, Tzanakos G, Panayiotakis G. “Suitability of new anode materials in mammography: Dose and Subject Contrast considerations using Monte Carlo simulation” Medical Physics 2006; 33:4421-4435. 68. Atlamazoglou V, Thireou T, Hamodrakas Y, Spyrou G. “MetaBasis: A Web-Based Database Containing Metadata on Software Tools and Databases in the Field of Bioinformatics”, Appl Bioinformatics 2006;5(3):187-92. 69. Sakellaris T, Spyrou G, Tzanakos G, Panayiotakis G. “Monte Carlo simulation of primary electron production inside an a-selenium detector for x-ray mammography: physics”, Phys Med Biol. 2005 Aug 21;50(16):3717-38. 70. Delis H, Spyrou G, Panayiotakis G, Tzanakos G. " DOSIS : A Monte Carlo Simulation Program for Dose Related Studies in Mammography", Eur J Radiol. 2005 Jun;54(3):371-6. 72. G Spyrou, K Koufopoulos, S Vassilaros and P Ligomenides, “Computer Aided Image Analysis and Classification Schemes for the Early Diagnosis of Breast Cancer”, HERMIS International Journal of Computer mathematics and its Applications. Vol. 4. 2003, pp.175-181. 74. G Spyrou, G Tzanakos, G Nikiforides and G Panayiotakis, “A Monte Carlo simulation model of mammographic imaging with X-ray sources of finite dimensions”, Phys. Med. Biol. Vol. 47, Issue 21, March 2002, pp 917-933. 75. G Spyrou, G. Panayiotakis and G. Tzanakos, “MASTOS: Mammography Simulation Tool for design Optimization Studies”, Medical Informatics, Vol. 25, No 4, Oct.-Dec. 2000, pp 275-293. 76. G Spyrou, G Tzanakos, A Bakas and G Panayiotakis, “Monte Carlo Generated Mammograms: Development and Validation”, Phys. Med. Biol. Vol. 43, Issue 11, November 1998, pp 3341-57. 3. Anastasis Oulas, George Minadakis and George M. Spyrou, Classifying Variants of Unknown Significance by Combining Polygenic Risk Score and Network Analysis, The 6th International Conference of the Cyprus Society of Human Genetics, Nicosia Cyprus 24-25 Nov 2017. 5. Oulas A, Minadakis G and Spyrou GM. Network Based Approaches for Classifying Variants of Unknown Significance. Hellenic Bioinformatics Conference, 6-9 September 2017, FORTH, Heraklion, Greece. 6. Seitanidou C, Skrempou G, Psatha K, Oulas A, Drakos E, Spyrou GM and Aivaliotis M. Gene Co-expression Network Analysis on Mantle Cell Lymphoma Transcriptomics Data Sheds Light on Novel Diagnostic, Prognostic and Therapeutic Strategies. Hellenic Bioinformatics Conference, 6-9 September 2017, FORTH, Heraklion, Greece. 7. Styliani V. Brili; Constantinos Anagnostopoulos; Evangelos Oikonomou; Nikoletta Pianou; Emmanouil Athanasiadis; Alexandros Georgakopoulos; Pavlos Kafouris; George Spyrou; Iosif Cutajar; Petros Nihoyannopoulos; Dennis Cokkinos; Dimitris Tousoulis. The role of 18 f-fluorodeoxyglucose positron emission tomography in the investigation of regional aortic inflammation in patients with successfully repaired coarctation of the aorta. J Am Coll Cardiol. 2016;67(13_S):907-907. 8. Georgios Benetos; Konstantinos Toutouzas; Iosif Koutagiar; George Agrogiannis; Aleksandros Georgakopoulos; Nikoletta Pianou; Pavlos Kafouris; Sofoklis Trachanellis; Nikolaos Patelis; Nikolaos Bessias; Konstantinos Filis; Chris Klonaris; Efstratios Patsouris; Elias Siores; George Spyrou; Constantina Aggeli; Eleftherios Tsiamis; Dennis Cokkinos; Dimitris Tousoulis. Non-invasive assessment of atherosclerotic carotid plaques by 18f-fluorodeoxyglycose positron emission tomography/computed tomography (18f-fdg pet/ct) imaging and microwave radiometry (mwr): validation with histopathological findings. J Am Coll Cardiol. 2016; 67(13_S):1813-1813. 9. G Benetos , K Toutouzas , I Koutagiar , A Georgakopoulos , N Pianou , S Trachanellis , N Patelis , G Agrogiannis , N Bessias , K Filis , C Clonaris , G Spyrou , E Patsouris , CD Anagnostopoulos , D Tousoulis. Local inflammation of carotid atherosclerotic plaques evaluated by 18f-positron emission tomography is associated with increased temperature: validation with histopathological and immunohistochemistry. European Society of Cardiology (ESC) Congress, 27-31 August, 2016, Rome, Italy. 10. I Koutagiar , K Toutouzas , G Benetos , N Pianou , A Georgakopoulos , E Athanasiadis , S Galanakos, M Metaxas , G Spyrou , P Kafouris , D Cokkinos , D Tousoulis , CD Anagnostopoulos. Morphological and functional characteristics of the carotid plaques are not correlated: insights from positron emission tomography and microwave radiometry. European Society of Cardiology (ESC) Congress, 27-31 August, 2016, Rome, Italy. 11. S Brili , E Oikonomou , N Pianou , A Antonopoulos , E Athanasiadis , A Georgakopoulos , G Siasos , G Spyrou , P Kafouris , I Cutajar , C Anagnostopoulos , D Tousoulis. Regional inflammation of the aorta assessed by 18F-fluorodeoxyglucose positron emission tomography is associated with systemic inflammatory and echocardiographic indices in marfan syndrome. European Society of Cardiology (ESC) Congress, 27-31 August, 2016, Rome, Italy. 12. I Koutagiar , K Toutouzas , J Skoumas , G Benetos , P Kafouris , S Galanakos , M Metaxas , A Rigatou , G Spyrou , D Tousoulis , CD Anagnostopoulos. Higher arterial wall inflammation in familial combined hyperlipidemia (FCH) compared to familial hypercholesterolemia (hFH), independently of LDL levels. European Society of Cardiology (ESC) Congress, 27-31 August, 2016, Rome, Italy. 13. G Benetos , K Toutouzas , I Koutagiar , A Georgakopoulos , N Pianou , M Metaxas , G Agrogiannis , E Athanasiadis , G Spyrou , K Filis , E Siores (Bolton,GB), E Patsouris , D Cokkinos, D Tousoulis , CD Anagnostopoulos. Increased arterial inflammation assessed by positron emission tomography is associated with higher thermal heterogeneity and macrophage infiltration in carotid plaques. European Society of Cardiology (ESC) Congress, 27-31 August, 2016, Rome, Italy. 17. I Koutagiar , K Toutouzas , G Benetos , E Athanasiadis , K Filis , A Georgakopoulos , G Spyrou , DV Cokkinos , D Tousoulis , CD Anagnostopoulos. Carotid artery stenosis does not predict local inflammatory activation: Implications from new imaging modalities. European Society of Cardiology (ESC) Congress, August 29 - September 02, 2015; London, United Kingdom. 18. George M Spyrou, Simulations in Medicine and Biology: Insights and perspectives, Journal of Physics: Conference Series 574 (2015). 20. Lykoudi, A., Kolialexi, A., Tounta, G., Papanikolaou, Th., Tsokaki, Th., Spyrou, G., Bourdakou, M., Athanasiadis, E., Mavrou, A., Papantoniou, N. (2015) Expression profile of miRNAs in human placentas from pregnancies Preeclampsia. 19th International Conference on prenatal diagnosis and therapy, 12 – 15 July 2015, Washington DC , USA. 21. E. Papadavid, G. Tounta, G. Spyrou, V. Nikolaou, M. Bourdakou, E. Athanasiadis, A. Lykoudi, A. Mavrou, C. Antoniou, A. Kolialexi, ”miRNA expression profile in tumor-stage mycosis fungoides”, EORTC Cutaneous Lymphoma Task Force meeting, Oct 24-26, 2014, Paris, France. 22. Ioannis Andreadis, George Spyrou, Konstantina Nikita, “Investigating the Performance of a CADx Scheme for Mammography in Specific BIRADS Categories”, 2014 IEEE International Conference on Imaging Systems & Techniques, Oct 14-17, Santorini, Greece. 28. Alexandros C. Dimopoulos, John Lakoumentas, Argyro Antaraki, Antonios Frigas, Emmanouil K. Ikonomakis, Marinos Sampson, Anastasios Tagaris, Aikaterini Liakou, Emmanouil Athanasiadis, George Spyrou and Panos Ligomenides, “e-Prolipsis: A web based risk estimation platform to support and register breast cancer diagnosis in Greece”, 2012 IEEE 12th International Conference on Bioinformatics & Bioengineering (BIBE), Larnaca, Cyprus, 11-13 November, 2012. 29. Paraskevi Gkeka, Emmanouil Athanasiadis, George Spyrou and Zoe Cournia, ” Enhancing the effectiveness of virtual screening by using the ChemBioServer: Application to the discovery of PI3Kα inhibitors”, 2012 IEEE 12th International Conference on Bioinformatics & Bioengineering (BIBE), Larnaca, Cyprus, 11-13 November, 2012. 30. Katerina Karayianni, George Spyrou and Konstantina Nikita, Clustering Microarray Data using Fuzzy Clustering with Viewpoints”, 2012 IEEE 12th International Conference on Bioinformatics & Bioengineering (BIBE), Larnaca, Cyprus, 11-13 November, 2012. 31. Sakellaris T, Koutalonis M, Spyrou G and Pascoal A, “A Monte Carlo study of the influence of breast thickness, breast composition and mean x-ray beam energy on the generalized image quality metrics of an a-Se digital mammography system”, Radiological Society of North America, 2012 Annual Meeting, November 2012, Chicago, USA. 33. Sakellaris T., Pascoal A., Koutalonis M. And Spyrou G. “Developments of a Monte Carlo model to simulate digital mammography”, European Medical Physics and Engineering Conference 2011, September 2011, Dublin, Ireland. 38. Andreadis, I. Nikita, K. Antaraki, A. Ligomenides, P. Spyrou, G., “Investigating the Image Features Landscape for the Classification of Breast Microcalcifications”, The 2010 IEEE International Conference on Imaging Systems and Techniques (IST), 1-2 July 2010, Thessaloniki, Greece. 43. M Koutalonis, H Delis, G Spyrou and G Panayiotakis, “Optimization of geometric and electronic magnification in mammography: a Monte Carlo simulation study”, ECR 2009, European Congress of Radiology, March 6-10, Vienna, Austria. 59. Ioannis Valavanis, George Spyrou, Konstantina Nikita, "Investigating the structure of protein similarity networks both on sequence and structure level", 8th Hellenic European Conference on Computer Mathematics and its Applications – HERCMA 2007, 20-22 September 2007, Athens. 60. I. Andreadis, G. Spyrou, A. Antaraki, G.Zografos, D. Kouloheri, G. Giannakopoulou, K. S. Nikita & P. A. Ligomenides, " Combining SVM and Rule Based Classifiers for optimal classification in breast cancer diagnosis", 8th Hellenic European Conference on Computer Mathematics and its Applications – HERCMA 2007, 20-22 September 2007, Athens. 61. A Frigas, G Spyrou, G Zografos, D Koulocheri, J Mantas, P Ligomenides, “Clinical trial of a CAD system for microcalcification detection and classification”, 12th World Congress on Health (Medical) Informatics, MEDinfo2007, Brisbane Convention Centre, 20–24 August, 2007. 62. A. Gaitanis, G. Kontaxakis, G. Panayiotakis, G. Spyrou & G. Tzanakos, “The role of the updating coefficient of the ML-EM algorithm in PET image reconstruction”, Annual Congress of European Association of Nuclear Medicine (EANM) 2006, 30 September – 4 October 2006, Athens - Eur. J. Nucl. Med Mol.Imag., 33 (Suppl. 2):314, 2006. 63. M. Koutalonis, H. Delis, G. Spyrou, L. Costaridou1, G. Tzanakos and G. Panayiotakis, “Monte Carlo assessment of average glandular dose and percentage depth dose in magnification mammography”, 10th International Symposium on Radiation Physics (ISRP-10), 17-22 September, 2006, Coimbra, Portugal. 64. H. Delis, G. Spyrou, L. Costaridou, G. Tzanakos and G. Panayiotakis, “Evaluating the figure of merit in mammography utilizing Monte Carlo simulation”, 10th International Symposium on Radiation Physics (ISRP-10), 17-22 September, 2006, Coimbra, Portugal. 71. Frigas Α, Spyrou G, Koufopoulos K, Vassilaros S, Mantas J , Ligomenides P, “Using modules of a computer aided diagnosis system in an advanced training scheme for radiologists”, the 7th Hellenic European Conference on Computer Mathematics and its Applications – HERCMA 2005, September 22-24, 2005. 72. Dovrolis N., Kokkoris E., Printezi F., Schalekis N. and Spyrou G., “A cell-like approach to grid computing”, the 7th Hellenic European Conference on Computer Mathematics and its Applications – HERCMA 2005, September 22-24, 2005. 73. H. Delis, G. Spyrou, G. Tzanakos, L. Costaridou and G. Panayiotakis. "Dose and Image Optimization in Mammography: Monte Carlo Simulation Studies", Biomedizinische Technik (Biomedical engineering), Vol. 50 (s2), 1336-1337, Proceedings of the 14th International Conference of Medical Physics, September 2005, Nuremberg, Germany. 74. H. Delis, G. Spyrou, V. Vlachopoulou, L. Costaridou, G. Tzanakos and G. Panayiotakis. "Pathological findings detectability dependence on mammographic spectra using Monte Carlo simulation", 1st International Conference on Experiments/ Process / System Modelling/ Simulation / Optimization, June 2005, Athens, Greece. 75. H. Delis, G. Spyrou, G. Tzanakos and G. Panayiotakis. “Generation of theoretical mammographic spectra for Monte Carlo based simulation studies”, 1st International Conference on Experiments/ Process / System Modelling/ Simulation / Optimization, June 2005, Athens, Greece. 76. Frigas A, Spyrou G, Mantas J, Ligomenides P, “Design of a training scheme for radiologists based on a computer aided diagnosis system”, European Federation for Medical Informatics (EFMI) Special Topic Conference, March 2005, Athens, Greece. 77. H Delis, G Spyrou, G Tzanakos and G Panayiotakis, “Dose And Image Characteristics Of New Mammographic Anode Materials. Monte Carlo Simulation Studies”, European Congress of Radiology, Vienna, Austria, 2005. 82. T Sakellaris, G. Spyrou, G. Tzanakos and G. Panayiotakis. “Digital Mammography using a-Se: Monte Carlo Generated Energy and Spatial Distributions of Primary Electrons”, the X Mediterranean Conference on Medical and Biological Engineering and Computing, Aug 2004, Ischia, Italy. 83. H. Delis, G. Spyrou, T. Sakellaris, G. Tzanakos and G. Panayiotakis. “Dosimetric Charactreristics Of New Anode Materials In Mammography: Monte Carlo Simulation Studies”, the X Mediterranean Conference on Medical and Biological Engineering and Computing, August 2004, Ischia, Italy.